Description: These steel spindles have a "V" shaped groove along one side to receive a grubb screw. Description: These steel spindles are threaded to M10 at each end to allow use with both threaded and square bored knobs. Sizes: 7.8mm square, 120mm long. Description: These steel spindles are drilled through with M5 threaded holes to allow fixing in a wide range of positions. Sizes: 7.6mm square, 140mm long. Description: When used in conjunction with an M10 Threaded Spindle, this washer allows a rim doorknob to be used with a mortice knob. Normally this is not possible as there is no way to stop the spindle and/or knob being pulled out. Sizes: 36mm diameter, 6mm projection. Description: These steel surface mounted spindles allow a single door knob to be dummy fixed to a push/pull door (usually a cupboard door) where a latch is not fitted. One side of the spindle has a "V" shaped groove to receive a set screw. Sizes: 7.8mm square, 24mm projection, 33 x 1.6mm base. Description: These steel surface mounted spindles allow a single door knob to be dummy fixed to a push/pull door (usually a cupboard door) where a latch is not fitted. 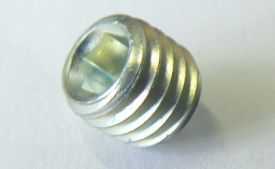 The spindle is threaded, allowing it to work with both square bored and threaded knobs. Sizes: 7.8mm square, 20mm projection, 25 x 2.5mm base. Description: These steel spindles allow a square bored door knob to be screwed directly onto a wooden door - so it acts like a big woodscrew. One side of the spindle has a "V" shaped groove to receive a set screw. Sizes: 7.8mm square. 30mm grooved square section, 30mm screw. Description: These steel spindles allow a square bored door knob to be forced directly onto a wooden door to give a very secure fit. One side of the spindle has a "V" shaped groove to receive a set screw. Sizes: 7.8mm square. 43mm grooved square section, 27mm sharpened "fishtail". Sold in packs of 10. Suitable for most new door knobs. Hardened tip with hex head to work with 2.5mm Allen key (see below). Sold in packs of 10. Hex keys are used to tighten grub screws in door knobs. This size fits into M5 grub screws (such as above). 57 x 20mm "L" shape.